The length of time, measured in degrees of crankshaft rotation, an intake or exhaust valve in a reciprocating engine is open. Engineering improvements include the first commercial application of Continuously Variable Valve Duration (CVVD) technology. 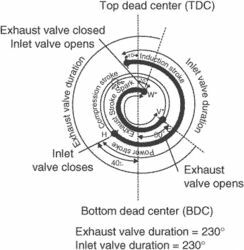 It was concluded that the best intake valve duration was that of the baseline engine, while reducing the baseline exhaust valve duration by 10% was optimal. 0-litre 197bhp i-VTEC engine with a seven-speed gearbox, that's six close-ratio forward gears, all pulling well within the VTEC rev range of 6,0008,000, where the valve duration changes and the fun really begins. In connection with the engine's patented valve mechanisms, the timing controls also allow the engine to self-start, thus eliminating the need for a starter motor, and change the valve duration to increase the engine's efficiency. 6-litre T-GDi engine incorporates an array of new technologies, including Continuously Variable Valve Duration (CVVD), which continuously adjusts the inlet and exhaust valves' opening times, optimizing the timing to suit all engine speeds and conditions. The patented valve/throttle component, comprised of a uniquely designed cam mechanism driven by hydraulics, serves several important functions in Cyclone's high performance steam engine, including: allowing the engine to self-start, thus eliminating the need for a starter motor; changing valve duration to increase the engine's efficiency; and reversing the rotation of the pistons to allow the engine to run backwards.